When I saw Susan's Imagination and Creativity challenge this week and then Let's Ink It Up came up with use your favorite stamp with a charm this was the stamp that came to mind for these two challenges. I keep this stamp above my desk as much for inspiration as for using. I love the heart with dream and the heart with art, but then for those down days when you feel yourself behind the 8 ball and your creativity has tanked, I look at the heart that says, 8 Ball, corner pocket and I visualize sinking that ball with confidence and somehow I feel a little spark and bingo, ideas start to spark. Each week Susan has lots of inspiration and food for thought on her challenge blog. If you haven't found her click on the link above and give her challenges a try. You might find some sparklers there. 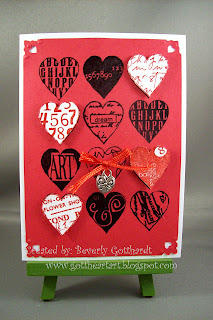 Supplies: White Card Blank 4" X 5 1/2" The Paper Studio, Papers-red unknown, Stampin Up-Whisper White, Stamp-Inkadinkado, Ink-Ranger Archival Ink-Jet Black, Stampin Up-Riding Hood Red, VersaMark Ink Pad, Stampin Up clear embossing powder, Martha Stewart-embossed Trefoil Heart border punch, charm unknown, red ribbon unknown, Stampin Up dimensionals. 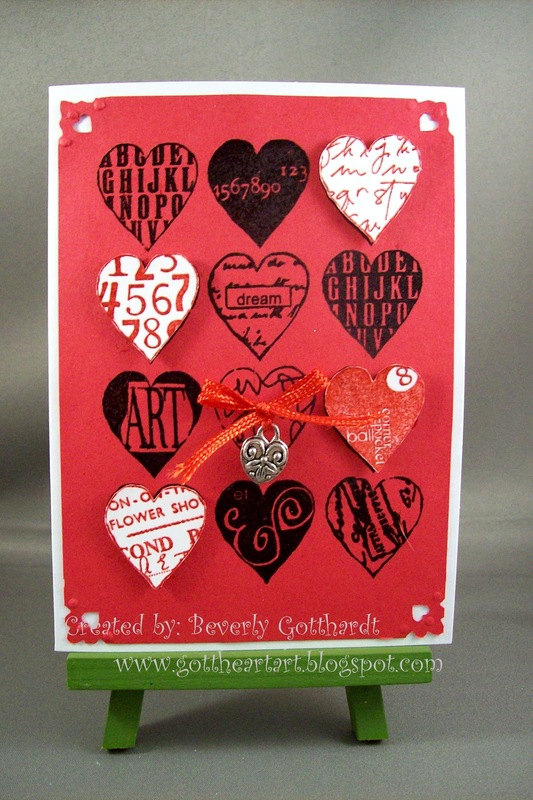 Beautiful card, I love your choice of stamps! Thanks for joining us at Let's Ink It Up and good luck! Ah, Beverly! Thanks for your kind words about my blog, and thanks for being one of the most consistent participants in the challenges! Thanks for using RED for your card, too - one of my very most favorite colors! My stamps are all unmounted, but I have a few of the blocks out for inspiration, too - it's a nice pick-me-up, like you said. Beautiful card! Beautiful colors, love how you have made it 3D! Great card! THanks for playing at Let's Ink It Up! Those hearts are very cute. Thanks for playing with Lets Ink It Up. Love the dimension with all of your wonderful hearts ... and the wonderful vision of sinking that eight ball in the corner pocket ... fabulous card. Your Card is stunning. I love the stamps, and colours. And the charm is beautiful.